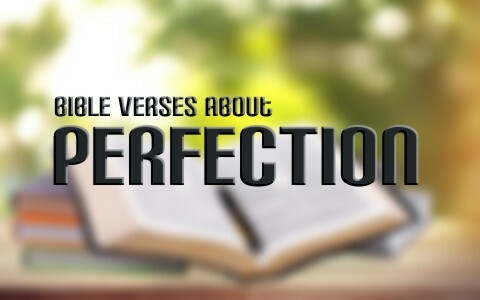 Here are seven Bible verses that speak about perfection and what they mean to the believer in Christ. This has been one of the most misunderstood and troubling Scriptures in the entire Bible because it presents a huge problem for us. How can fallen mankind ever achieve perfection? We all fall far short of God’s glory (Rom 3:23) and none of us are good at all (Rom 3:10-12) and all deserve to pay the wages of sin which is death but somehow, God still offers us eternal life in Jesus Christ (Rom 6:23). Ah, that’s it! It is only in Christ that we might have Jesus’ own righteousness imputed (credited) toward us and only then does God see us as perfect. In the Book of Revelation, John asks “Who are these, clothed in white robes, and from where have they come?” [John] said to him, “Sir, you know.” And he said to me, “These are the ones coming out of the great tribulation. They have washed their robes and made them white in the blood of the Lamb” (Rev 7:13-14). God sees our robes as cleansed by the blood of Christ and not our sinful nature and filthy “dirty rag” works. We receive Jesus’ own perfection (2 Cor 5:21). This reminds me of Revelation 21:27 which says concerning the kingdom of heaven, “nothing unclean will ever enter it, nor anyone who does what is detestable or false, but only those who are written in the Lamb’s book of life.” The disciples knew that the scribes and Pharisees tithed on everything, and looked to be the most holy men in Judea so they were astounded that their own righteousness must exceed theirs! The Pharisees even fasted twice a week (Luke 18:12). Once again, we see the unbridgeable gap of ever being able to enter the kingdom, not to mention even seeing it (John 3:3-7), if we are not absolutely perfect (Rev 21:27). The scribes and the Pharisees thought they did works to earn their righteousness but the believer knows that it is “by grace you have been saved through faith. And this is not your own doing; it is the gift of God, not a result of works, so that no one may boast” (Eph 2:8-9). The admonition for the Christian to be “steadfast” means to stand fast…standing firm on the faith once delivered or delivered once and for all and that means contending or fighting for it (Jude 1:3). The goal is that we “may be perfect and complete” and lack nothing at all. Again, how is perfection possible? The Greek word used for “perfect” is “teleios” which in James 1:4 means “brought to its end, finished,” or “completed.” James knows we can’t achieve perfection in this life but he does believe we should have our steadfast faith in Christ come to completion or maturity. Complete perfection will only come on the day of our death or at Christ’s return, whichever comes first. Want to know perfection? Don’t look at me but look at the Word of God. Only the Word of God, which is also called the “law of the Lord,” is perfect. Only the law of God can revive the soul or as the Hebrew says “turn back to” or “turn” the soul. We all needed heart surgery before we were saved, having wicked, evil hearts that are deceitful above all things (Jer 17:9) however God promised Israel long ago, and I believe it has application for us too, that “I will give you a new heart, and a new spirit I will put within you. And I will remove the heart of stone from your flesh and give you a heart of flesh” (Ezk 36:26). Perfection was not attainable for the Levitical priesthood in the Old Testament because priests were men and like men, all of them (and us) are conceived and born into sin (Psalm 51:5). The author of the Book of Hebrews is trying to show us that perfection cannot ever be achieved by human effort. Even if the Old Testament priests did everything perfectly, they’d eventually sin. Not so with the High Priest of Heaven; the Priest Who became the perfect, sinless, once-and-for-all offering to God that He accepted and was well pleased with. It is only “by that will we have been sanctified through the offering of the body of Jesus Christ once for all” (Heb 10:10). Following Jesus sounded easy to many but eventually many fell away (John 6:66). What separated the professors of faith from the possessors of faith was what they loved the most. Where Jesus said “If you would be perfect” should be clarified. The original word indicates that it should read “If you would be complete” which reminds me of James 1:4. The same idea applies here. It’s not perfection that Jesus is asking for but its completion; completion of the duty to love God above everything and everyone and to love others. This means we seek His kingdom above all things and that means seeking the King of that kingdom first (Matt 6:33). Jesus found out where this rich man’s heart was because “When the young man heard this, he went away sad, because he had great wealth” (Matt 19:22). Have you ever read about the supremacy of Christ and His priesthood? If not, you’ll find it in the Book of Hebrews. The old sacrificial system required the priests to continually offer up sacrifices to cover the sins of the people, including for the priests themselves. It never ended. That’s why there were no chairs in the temple. Their work was never done but Jesus sat down at the right hand of the Father after His one-time sacrifice (Mark 16:19). The differences between the two priesthoods are infinite. The Old Testament animal sacrifices only covered sin. Jesus’ death on the cross takes away sins. The priests of old sacrificed day after day but Jesus did it once and for all and for all time! The Old Testament sacrifices never imputed righteousness to the people. Jesus’ atoning sacrifice perfects us on His behalf (2 Cor 5:21). Thanks for this article. I am struggling all the time between the affairs of this world and the fellowship with our Savior. I believe I am not doing well in anything. I feel all the time like a lukewarm Christian and I know God hates that. If I die right now, I am not sure of my salvation. And I know Jesus Christ died on the cross for all mankind including me and He is the only one through whom we are saved, but I let the desires of my heart be a stumbling block in my walk with Jesus. Pray that I may overcome and see what prevents me from following Christ with all my heart and soul. May the God keep blessing you with these inspirational messages. Thank you! Amen my friend. So very well said. I know I could never be good enough to achieve perfection…Jesus must make up the difference, which is 100%.